I hurt my hand. I have done it before and I know the best remedy requires wrapping my left wrist and letting it rest for a couple of days. Most people think of the importance of their right hand – particularly if they are right-handed. Writers need both hands, or at least I do. It seems that my ability to type is directly related to my ability to use both hands. 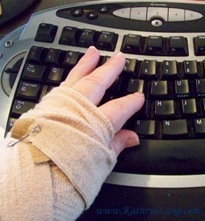 With my left hand wrapped up, I am relegated to the one finger typing system. That takes a long time! The speed of my work has dramatically slowed. There has to be some way for me to continue productivity as a one-armed writer. •	Now would be a great time to work on those speeches I have been planning to post on YouTube. Most of the work is cut and paste with the mouse so I only need the one hand to do that. •	I purchased a digital recorder a while back for when I give talks and presentations. It could also be used to dictate changes in my books or studies, or to create new content that can be typed later. •	Reading! I have been promising myself time to catch up on all of my reading. What better excuse than being unable to do anything else. •	The counseling class that I started a few months back has been taunting me lately. Spending the next few days focused on it would get it out of the way and me one step closer to getting my counseling certification. Writing involves more than typing words on the keyboard. By focusing on some of the other avenues, I will be in a position to let my hand heal. I will also get all of those tasks done that I have been putting off because I HAD to write. What do you do when you find you are unable to do what you thought you should do?